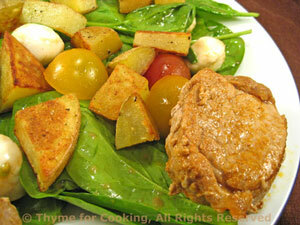 Spinach Salad with Pork, Potatoes, Thyme for Cooking easy, spring salad. Cut potatoes into bite-size cubes. Slice pork into 1/2" (1.25cm) thick slices. Sprinkle both sides with cumin, paprika and garlic. Heat remaining 2 tsp olive oil in a large, nonstick skillet. Add pork and sauté, medium-high heat, until cooked through, about 2 - 4 minutes per side. Put mustard and vinegar in a small bowl and whisk to combine. Slowly drizzle in olive oil, whisking constantly. You may have to stop adding oil and just whisk - you don't want to see the oil separately, it should be incorporated as it goes in. Prepare spinach, wash and spin dry. Put spinach into a large bowl, tearing any large leaves. Add 2 tbs vinaigrette and toss well to coat. Divide spinach and arrange on 2 plates. Top with potatoes, tomatoes and cheese. Arrange pork around the edge of the salad and serve, remaining vinaigrette on the side.